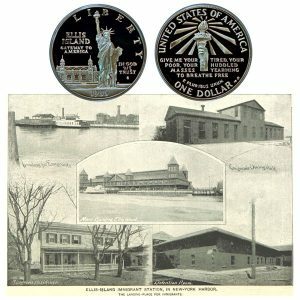 Today, the Statue of Liberty Commemorative Silver Dollar Coin remembers the Ellis Island fire that burned almost all the buildings on June 15, 1897. Only the Power-House Saved from Destruction. The immigrants at the station safely landed in this city, and no one reported seriously hurt—the flames started in the main building, which is soon a wreck. Every building on Ellis Island except the power-house was totally destroyed by fire early this morning, but all of the 270 Immigrants the structures contained, so far as is known at present, were saved. The immigrants, most of whom had landed here yesterday, were almost all in the new wing of the main building, only a small number of persons being in the hospital. In ten minutes after the alarm was given they had all been quietly awakened and marched safely on board the John O. Carlisle, the newest Ellis Island boat. So far as known no one was seriously injured in fighting the fire or from any other cause. The first intelligence of the fire was received In this city at 12:38 a. m. The harbor police from their station at Pier A, North River, saw a flame bursting from the windows of the main building on the island. Word was at once telephoned to Police Headquarters, and the fireboat New-Yorker was dispatched to the island. At the same time the sergeant in command at Pier A called the reserves out of bed in the station, and with every other man he could spare dispatched them in two of the police naphtha launches to the island. The police-boat Patrol is laid up for repairs, and the slower launches had therefore to be used. The men were under command of Roundsman McCormack. Captain Schultze, who was at his home was also telegraphed for, and a call was sent out from Pier A for the reserves from the other precincts in the lower part of the city. Twenty-five men were obtained from the Old Slip and Church-St. stations and hurried to Pier A to be ready for any emergency. When first seen by the lookout at the police station the fire was only a flame, about as large as a man’s hand, coming out of a window on the second floor at the east end of the main building. The flames spread rapidly, however, and at 1:05 a.m.— that is, by the time the boats were fairly on their way to the island—the eaves of the roof began to fall, setting fire to the wooden piers and docks on either side. At 1:12 a.m. the whole building was a mass of flame, illuminating the entire inner harbor. The tops of the skyscrapers in the city were outlined in bold relief by the red light, the gilt cornice of the Manhattan Life Building reflecting the light until that building itself seemed in flames, too. The southern end of the city is extremely quiet at this hour of the morning, but within thirty minutes of the starting of the fire, several hundred spectators were hurrying toward the Battery. The owners of rowboats and other small craft were present in considerable numbers, and they endeavored to make money by letting their boats to anxious people. Fears Of Great Loss Of Life. The fire presented a magnificent spectacle from the Battery, and rumors of a terrible loss of life flew thick and fast Although it was known that it had not been an unusually busy day at the island, and that the comparatively few immigrants landed were passed swiftly through the pens, even the police were certain that a serious loss of life must have resulted. At first the flames could not be seen to diminish perceptibly before the tons of water thrown on the fire by the fireboats. At 2 a. m. the fire was plainly at its height, but after that gradually the red light over the Bay faded away. Safely Landed In This City. At 2:10 all apprehension for the safety of the people on the Island was allayed by the arrival at the Battery of the ferryboat John G. Carlisle which plies between the Battery and the island, with all the immigrants and the sick from the hospital on board. One of the women was suffering from typhoid fever. She was said to be in a serious condition. With the party were the doctors and nurses. Before the ferryboat arrived, ambulances had been summoned from Gouverneur and Hudson Street hospitals, so that the sick brought to the city could be cared for. The doctor in charge of the party said that, so far as he knew, no one had been burned or injured. All about there were ferryboats, tugs and small boats, willing to bring the people to the city, but some of the people in their excitement, feared at first to venture on the water. Just before the Carlisle arrived, a man who said he was D. K. Moscopaulas, an official interpreter on the island, rushed onto pier A, greatly excited. He had come to report for duty, he said. The crowd cheered him. The office was lighted up by tongues of flame. A moment later Silas Truman and George Hoolihan, of the janitor’s office, were by Gaines’s side, fighting the fire. While they were trying to get the flame under control, a draught of smoke and hot air lifted them off their feet and knocked them down the stairs to the ground floor. All of them were badly shaken up and more or less cut about the head and face. In spite of the severe fall they had sustained, however, they quickly arose and quietly aroused everybody in the buildings, displaying unusual presence of mind. Had they lost their heads and shouted, a panic would have followed and many lives would have been lost. The men’s coolness had a wonderful effect. Everybody saw at once that the buildings were doomed to fall in a short while, but they marched in an orderly manner out of the place and onto the John G. Carlisle. By the time the immigrants were boarding the boat a score of streams from the island fire apparatus were playing on the burning buildings. At 2:40 a. m. the only building on the whole island that would probably be saved was the engine-house to the extreme west, as the wind was blowing from that point, and the house in question is a fairly substantial building. It was impossible to save any of the other buildings, as the fire was entirely beyond control of the fireboats. Between three and four acres were covered with flames. As the second of the two fireboats left New York one of the watchmen of the island fell into the water. He was attempting to jump on board after the board had started, and just failed to clear the distance. Ropes were thrown into the water, and after an exciting five minutes the man was rescued. He was almost unconscious, and was immediately taken to the engine-room. There was a great deal of crowding among the various craft inside the breakwater of the island, and much delay was caused thereby to the fireboats and tugs sent to assist. Dr. Senner, Commissioner of Immigration, with Mrs. Senner, left his home, at No. 248 West One-hundred-and-twenty-third-st., at 1:40 a. m. on his way to Ellis Island. He said he felt no anxiety, as he was positive that precautions for a fire were so perfect that there could not possibly he loss of life. The new Immigration depot at Ellis Island was opened on New Year’s Day, 1891. The structure, like many other Government buildings, though of gigantic proportions, could not be termed an architectural masterpiece. It was built at a cost of about $500,000, the original estimate having been about one-half that sum. An idea of the building’s immense size may be gained from the fact that more than four million feet of lumber were used in its construction. The huge building covered the greater part of the island, the area of which was something less than five acres, but this was increased to about eight by driving spiles about the water-front and filling in the vacant spaces with earth. The building was of no particular style of architecture. It was three stories in height, with a tower at each corner The ground and upper floors measured each 404 by 154 feet. The first floor was devoted to railroad and baggage transfers and private offices. On the second floor the registrations and examinations were conducted. Among the general features of the building was a gallery which extended completely around this floor. From this the immigrants could be inspected by the public or those interested in them, without coming into actual contact with them. Detention rooms were also provided on this floor in abundance. There were rooms for paupers, another for lunatics, another for those suspected of being contract laborers, another for women and children, and so on. The telegraph and money exchange offices, postal stations, information bureau, railroad and steamship offices were all arranged so as to give the newcomers the least possible inconvenience. Sleeping-rooms were provided on the floor above. On the side facing the harbor were the offices of the immigration officials. The depot was built by Sheridan & Byrne. Roosevelt, Son & Miller did the pier work and spiling. The Statue of Liberty Commemorative Silver Dollar Coin shows with images of the Ellis Island buildings, circa 1893.